Last year I decided I needed a new tennis buddy, Craig isn’t really interested unless they’re corporate tickets and most of my friends aren’t that into tennis to spend their money on going. So I made the decision last year to take Alannah for the first time when she was only 9 years old. She loved it and wanted to return this year. 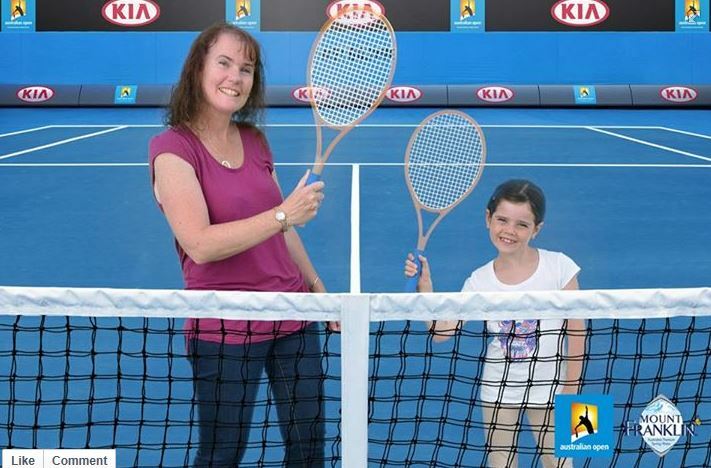 Awesome, new tennis buddy for mum! Australian Open Melbourne is one of the worlds best run world sporting events and you can really see why.I have been going to the Australian Open Melbourne for as long as I can remember, there were a few years there that I missed due to pregnancy and feeding but all in all I’ve been going for about 23 years. Back then it was a grass court event held at Kooyong and was a super cheap day out as hardly anyone went, by god how it has changed! They are going to great lengths to make tennis attractive for kids. Australia Open – there’s a few around on the grass area in front of Rod Laver Arena. Melbourne is the sporting capital of Australia, we do all the major sporting events and I have to say, we do it well. Melbourne is made for sport and the way the crowds are moved to and from the event is managed, and works, very effectively. 2014 attendances were recorded at 643,280 and 2015 attendances at 703,899 and it is expected to increase this year with Margaret Court Arena upgrade which increased capacity to 7,500 unfortunately it’s no longer included in the ground pass tickets see below for ticket costs. A ground pass includes viewing on all the outside courts and Hisense Arena but does not include Margaret Court and Rod Laver Arenas. Rod Laver Arena, or what us locals call Centre Court, has a capacity of 14,820 and has a retractable roof to ensure no disruption to play during the open due to extreme weather conditions (extreme heat or rain). Melbourne is known for its extreme weather conditions at this time of the year. It is not unusual for the weather to hit 40 degrees (110F) for consecutive days. There is an extreme weather policy in place for when the heat gets to the high 30’s that states that the roof can be closed. 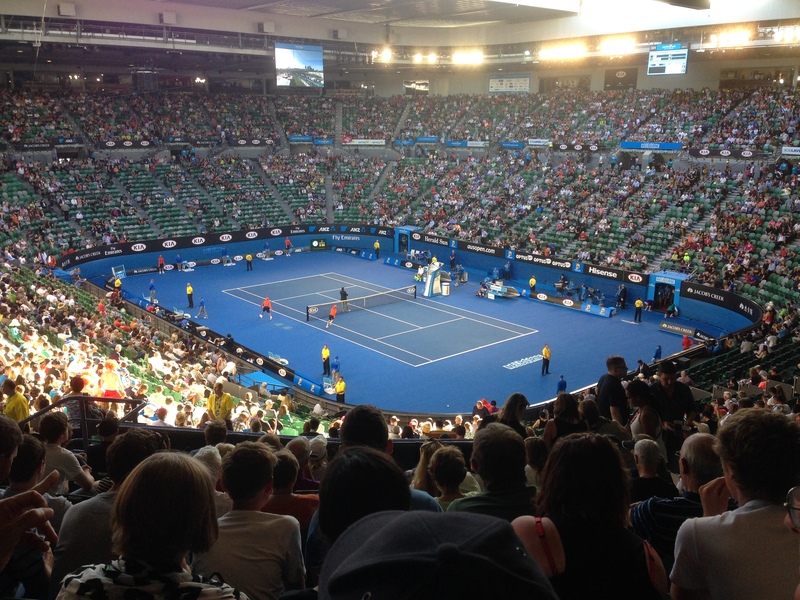 Rod Laver Arena aka Centre Court before play commenced. You can see well from almost any seat. Hisense Arena was added in 2000 and has a capacity of 10,500. Hisense also has a retractable roof and is a stand alone court located in the Melbourne Park complex. Ground passes are used to access Hisense Arena during the days. Prices vary depending on what stage of the tournament you are looking at. They have a game that starts at 7pm that is also included in the ground pass so if you stay all day and then get a seat for the evening on this court, you have had a pretty good day out for $20. I thought I had some photos of Hisense Arena but I can’t find them right now. Hopefully I will locate them and you won’t see this sentence! Margaret Court Arena was renamed in 2003 from Show Court 1. The recent redevelopment saw Margaret Court Arena expanded and now has the capacity for 7,500 with a retractable roof. It is also accessible from Rod Laver Arena and completely enclosed which is great for the unpredictable Melbourne weather. The redevelopment was completed in time for the 2015 Australian Open. Margaret Court Arena, we had great seats lower level row E.
These were great seats but to be fair I really enjoyed this arena. Luckily because I went both Monday (opening night) and the Tuesday night. You feel like you are on top of the game and nearly every seat in the arena is a great seat. On the Monday night I sat in the upper seating and I still thought they were great seats, of course until I got these the next night! I always like going in the first 3 nights of the tournament as you are guaranteed to see top ranking players. In 2015 we saw Federer v Lu and Sharapova v Martic. The top seeds, won as expected but it was great for Alannah to see the worlds best in action. In 2016 I have seen Sharapova v Hibino then Tsonga and Baghdatis, the next night Halep v Zhang then Wawringa v Tursunov. Alannah has decided that she would like to be a Australian Open tennis player when she gets older, so do I! 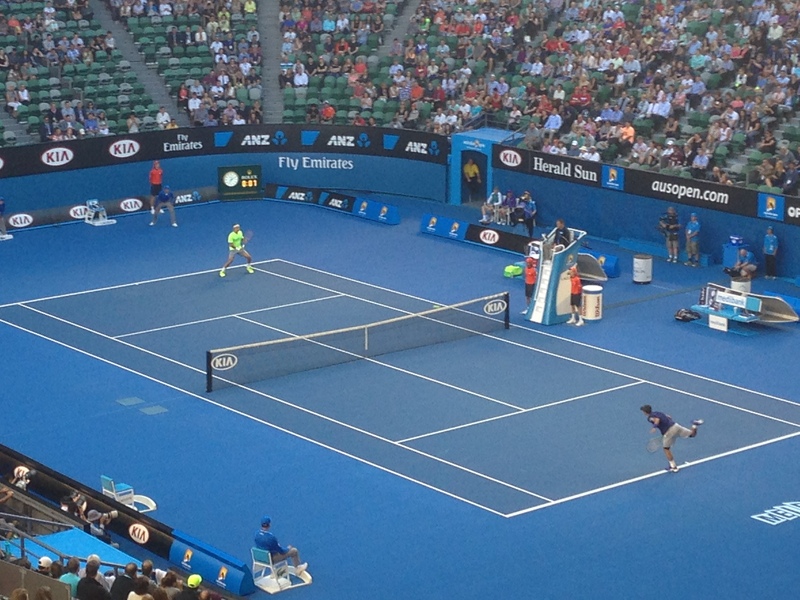 Being the first night I had hoped to see some Aussies up on Rod Laver Arena but wasn’t to be this year. The next night had 2 Aussie players on Rod Laver Arena so I will keep that in mind for next year! 2015 – Federer on the receiving end! I don’t think he even needed to warm up! Won in straight sets. 2016 – ‘Stan the Man’ Wawringa! He so chilled although I reckon we was cruising in first gear! We arrived at 5pm when the gates opened for the night session, we had a look around at all the sponsors advertising and had a little hit on the kids court. All the sponsors set up an advertising promotional activity type thing where the kids can have a go and either put your name in for a large prize or to test something for free. Alannah likes to have a look around and she enjoys the taste testing, a lot of them involve taking a photo that you can access later. As in doubles action at the Mount Franklin stand. About 6pm I thought we should head up to the court you will be attending and get some dinner before heading in to the court as play starts at 7pm. Seems like everyone else had the same idea. The queues were enormous and it took at 45mins to get something to eat. Food is very expensive, Alannah just had chips which were $5.50 and I had lemon crusted chicken with chips which was $11.30! Highway robbery and the reason for eating this, it was the shortest line and I didn’t want to miss the start of the game. At the game break between the male and females game, Alannah decided she wanted an ice cream in a cone so that set me back $5.50, I had a Coke Zero which was $5.00. You can take your own food in, on this occasion I had come straight from work so wasn’t really organised to be taking dinner as well. I noticed water was $4.50 a bottle which during those really hot days could become really expensive. We left just before the end of the Sharapova’s match. I said to Alannah we would leave as soon as she broke serve in the second set which she did on the 2nd game. I was glad we left as it was 10.15pm, she had had enough and I wanted to get out before the crowd. The Aussie Sam Groth was still playing on Hisense Arena and the marathon match between an other Aussie Kyrgios and Delbonis was also still going on Margaret Court Arena. This made our getaway also less stressful. We jumped on the first tram to Flinders St Station and beat the crowds. Sharapova doing her thing in red! She’s a champion. We got the train back to the nearest station to home and Alannah’s eyes were nearly falling out of her little head but she made it home and jumped straight into bed. I bet she dreamed of being a famous tennis player that night although there hasn’t been much talk of it since that night! Our selfie for 2015! 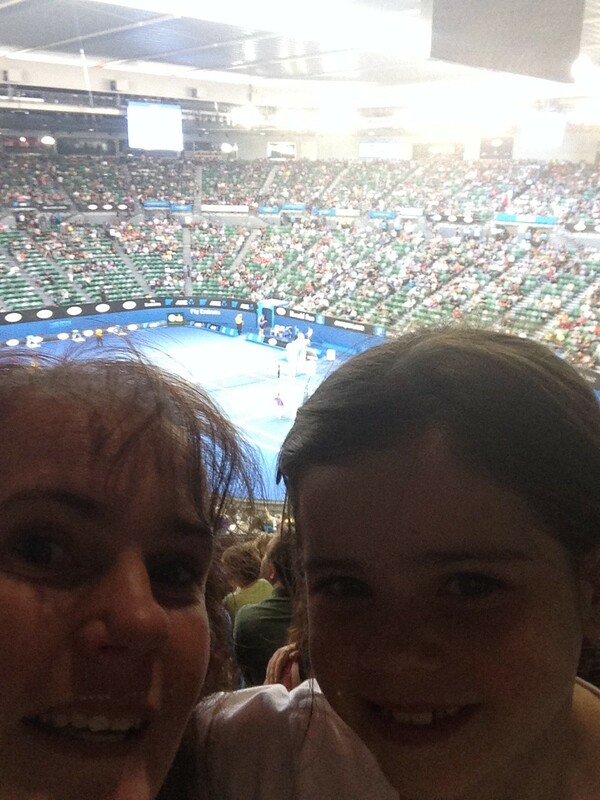 If you #aoselfie they were putting the pics on the big screen but we didn’t see ours! Cost varies depending what days you are attending and were you seats are located. Tickets for the night sessions start from $56 for the first couple of nights on Margaret Court Arena and then go up from there up to $225 on the last evening. The last evening tickets before the finals on Rod Laver Arena or on sale for $225 although earlier in the tournament they are available for $87 for the day session and for the evening $107 for the 3rd day of the tournament. Ground passes are a very affordable $45 before 5pm and $34 after 5pm. Ground passes include all the outside courts and Hisense Arena. This is pretty good value to be able to watch a Grand Slam event. When I was younger a ground pass was $20 per day and we would stay all day! Finals tickets are very expensive, expect to lay out in the vicinity of $400 per ticket! Yeah I know! There’s plenty to see and do, everyone was watching Hewitt’s first game of his last tournament so got a quick snap with no one around! I love the tennis and I think its great value for money to see a Grand Slam event early in the event. Its a shame that the finals are so expensive as I would love to see one of the final matches one year. It was very hot again this year with the weather being over 30 degrees on both nights. Security has stepped right up so expect to have your bags searched on the way in. Public transport is a well oiled machine, they move the people to and from the venue very well. The tram system is now free within the city and the tram takes people straight from the venue to Flinders St Station. Its a very efficient and easy system and one I’m proud to say Melbourne is at the top of their game in. We love that you and Alannah now have your own tradition. And such a fun one too. We love the tennis but much prefer to watch it at home with the air-conditioner on. Can’t wait to watch Alannah out there on the court in a few years! I do hope she makes it one day but it would help if she actually played tennis! Lol. She thinks she’s naturally gifted as I play tennis every Tuesday night, obviously she has never seen me play!